Edging and trimming the lawn is like having a manicure after cutting your fingernails. 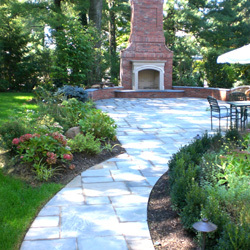 It smooths out any roughness and adds an elegant finishing touch to your landscape, and everything is just more perfect! But which lawn care activity is which, and how do you do them properly to give your lawn that manicured look? Edging or Trimming – Which is Which? Before you pull out the lawn tools, it’s important to know which activity you need to do to create the look you want. When you are edging, you define the line between a hard surface (sidewalks, driveways and curbing) and a growing area such as a flower bed, garden or lawn. 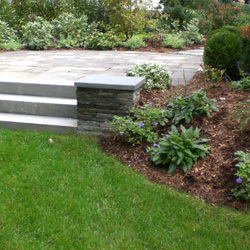 To achieve this, a vertical cut is made between the two using a spade or edging tool. Some have mastered the art of using the string trimmer to do this. This creates a crease-like separation between the organic (growing) and inorganic (non-growing) surfaces. Properly done, edging will help minimize weed growth in these cracks and crevices and gives the landscaping a smooth, formal appearance. Trimming removes the grass, weeds and other plants from areas a lawnmower can’t reach. Long wisps of grass along the side of the house, fence or other structure aren’t very attractive, and trimming them away will give a finished, uniform look to the landscaping. Most people use a string-trimmer or bladed trimmer for this work, but hand shears also do the job. Trimming is also often done around trees or in tight corners where a lawnmower is less effective. How often should trimming and edging be done? This depends upon your own personality. Some people feel edging and trimming is a requirement of every mowing. Others do edging and trimming every third or fourth time they mow, or whenever it may look necessary to give the lawn and landscape a uniform look. No matter how often you choose to do edging and trimming, it is important to do it effectively! Use only the proper tools for these landscaping tasks. This will help prevent injuries or strain on your hands, wrists and elbows, and will get the job done more quickly and efficiently. Check edgers and trimmers regularly to be sure they are sharp, well-oiled and in good functioning condition. Keep extra string for a trimmer on hand so you can quickly replace the spool when it runs out. Always practice good safety measures when edging and trimming. Wear safety goggles if there is risk of flying debris (as there often is), and keep the tools away from children and pets. 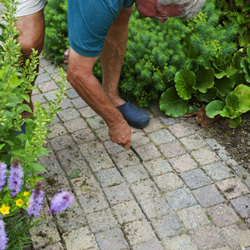 For many people, edging and trimming is all part of good lawn maintenance. Once you know the differences between them and how to do them well, you’ll be amazed at the difference these tasks make to the beauty of your lawn. © 2019 American Tree Garden Center & Landscaping. All rights reserved.